Petroleum products were a major aid in Allied efforts to win World War II. Before the war, homemakers relied on natural, common ingredients, such as baking soda and borax, to clean. With the availability of petroleum-based chemicals after the war, manufacturers developed ready-made cleaning products. Today, with greater understanding of the harm chemical ingredients cause humans and the environment -- and due to consumer demand -- manufacturers are developing less toxic, plant-based detergents. To find a safe detergent, ignore marketing claims and read ingredients. Conventional detergents can include a variety of hazardous, often petroleum-derived, chemicals, artificial fragrances and brighteners. After a wash, they're potentially absorbed by skin through clothes. They also evaporate into the air, where they can be breathed in, and enter the environment through groundwater. If you try to find out what's in conventional laundry detergent, you probably won't get far. Detergent ingredients aren't generally disclosed to consumers because they are considered trade secrets, protected by the government. Ingredients listed on a bottle of conventional laundry detergent are generally vague, notes Sixwisecom. An ingredient list might read exactly like this: cleaning agents (anionic and nonionic surfactants); buffering agent; stabilizer, brightening agent and fragrance. All of these terms mean nothing to the average consumer. What the ingredients are in reality include linear alkyl sodium sulfonates (LAS), synthetic surfactants, or cleaning agents, which release carcinogenic and reproductive toxins; petroleum distillates (napthas), which have been linked to cancer and lung damage; and alkylphenol ethoxylates (APEs), which mimic the hormone estrogen and cause endocrine disruption and other reproductive system problems. These are just a few. Synthetic fragrances can pollute your indoor air and worsen health conditions like asthma. Rather than man-made ingredients, plant-based detergents rely on ingredients that come from nature and biodegrade. Their ingredients include alkyl polyglucoside, a plant-based cleaning agent that dissolves and removes dirt, oil and grease; sodium gluconate from corn; sodium lauryl sulfate and sodium octyl sulfate, both derived from plants; fragrance from flower essential oils; glycerine from plants to keep the detergent stable in various temperatures; and oleic acid from plants to prevent excessive foaming. Some products might contain a very small amount of synthetic colorant to help stay natural dyes. Other laundry detergents might state they contain natural and biodegradable vegetable-based surfactants, such as coconut or palm. 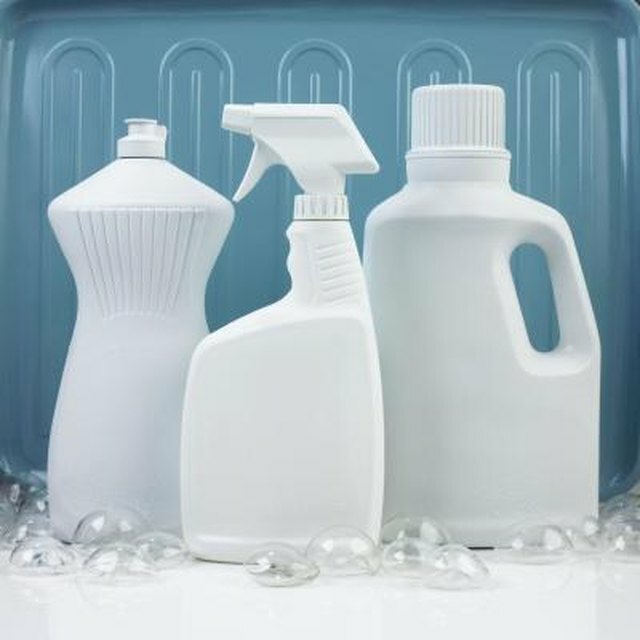 An obvious way to avoid harmful ingredients is to look at the product information for conventional detergents for the words “danger,” “poison,” “toxic” or “hazardous" Also avoid detergents that don't show an ingredient list. Ignore marketing claims, such as a stamp on the label saying the product is "all-natural" Instead, look for ingredients such as surfactants derived from plants, like coconut, soy or corn. For a natural, plant-based homemade laundry detergent, try this one from OrganicAuthority. Use a grater to shave down one bar of castile soap -- which is made from olive oil or contains plant-based ingredients -- into fluffy flakes. Thoroughly whisk the soap flakes together with 1 cup of washing soda (or baking soda) and 1 cup of borax. Store the mixture in an airtight container. Add 1 to 2 tablespoons to each load of laundry. History News Network: How Important Was Oil in World War II?